Prior to the 1990s, most people in Japan probably knew little more about India than it was the home of curry, snake-charmers and the Taj Mahal. Nowadays, though, it’s as if the two countries are moving ever-closer together — and not just because there are a lot more Indian restaurants around. Over the past five years in particular, there has been an influx of IT engineers from India arriving to fill a huge skills gap in Japan’s software industry — and in the process helping this country to remain globally competitive despite its rapidly shrinking and aging workforce. 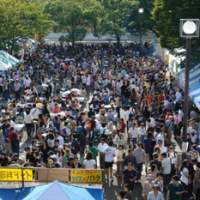 Compared to the United States, where 2.3 million Indians live and where a third of Silicon Valley’s engineers are said to be from India, Japan’s mere 16,988 Indians registered with the Immigration Bureau at the end of 2005 — less than 1 percent of Japan’s 2 million foreign residents — are a drop in the ocean. Nonetheless, it is a fast-growing group, with all but 4,000 having arrived in the last 10 years, said A.P.S. 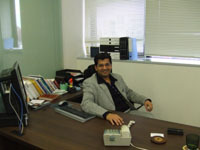 Mani, a 30-year Japan resident who heads Indian Community Activities Tokyo. He said around 10,000 of his compatriots live in the Kanto region, of whom 80 percent are IT professionals and their families. In fact, Indians were the fastest-growing group of foreign nationals in Tokyo in 2006, with their number jumping 8 percent from the year before, to 7,581, according to Tokyo Metropolitan Government data released last month. While many Indians here leave their families behind during their stint in Japan, some are now bringing them along — and they are “slowly and steadily” putting down roots here, Mani said, helped in part by the opening of two international schools catering to the Indian community. While Japan’s embrace of Indian IT might be relatively new, Indian connections in Japan are not. Documentation of the first Indian to ever set foot in Japan is found in a 1993 book titled “Nihon to Indo Koryu no Rekishi (Japan and India: the History of Exchanges),” in which Bodai Senna, a high-ranking Brahman monk from South India, is described as visiting Nara in the eighth century — from China, where he lived — to conduct the grand opening ceremony for the Birushana Nyorai (Big Buddha) at the Todaiji Temple. However, the formation of an Indian “community” had to wait until around a century ago, when 50 to 60 families from Sindh and Gujarat regions (Sindh is now part of Pakistan) settled in Kobe as Chinese silk-traders, Mani said, noting that later some more traders settled in Yokohama. Tragically, though, about 20 were killed in the 1923 Great Kanto Earthquake. Today’s “old-comers,” he explained, consist of their third-generation descendants. Interestingly, in the early 1900s Japan hosted a few Indian revolutionaries fighting against British colonial rule. One of these was Rash Behari Bose, who married the daughter of the owner of a Tokyo confectionery called Nakamuraya. To this day, Nakamuraya says on its corporate Web site that Bose was outraged by the bad taste of a dish sold here as “Indian curry.” As a result, he introduced an “authentic” Indian curry menu at Nakamuraya, having selected the spices and other ingredients himself. 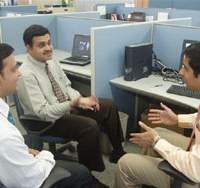 Fast-forward to 2000, and with India having emerged as a major global player in cutting-edge IT, then-Prime Minister Yoshiro Mori visited in 2000, paving the way for a relaxation of visa regulations for skilled IT professionals from India. Makoto Kojima, professor of economics at Takushoku University in western Tokyo, says 70 to 80 Indian IT companies, including major ones such as Tata Consultancy Services, Infosys and Wipro, have operations here. Tata’s Japan office alone has 300 employees, of whom 210 are Indians, according to the Yokohama-based company. And corporate Japan, especially in the manufacturing sector, is opening up eagerly to the power of Indian IT, which boasts more CMM Level 5 companies (the top software-industry global ranking) than any country in the world, he said. India’s IT prowess has been extensively put to use by numerous Japanese telecoms-, auto- and electronics-makers, especially in areas such as computer-assisted car design and cellphone software development, Kojima said. He also noted that India-based companies with Japanese clients frequently send engineers over to work here “on site,” but they have a lot more working on Japanese projects “offshore” in India. However Kojima, Japan’s leading authority on India’s software industry, pointed out that Japan’s use of Indian expertise is still very limited because of the lack of English-speaking staff at many Japanese corporations, and such firms’ risk-averse nature. Instead, many companies outsource software development to China, which has more Japanese-speaking engineers, he said. For Tokyo-based company software developer I.A.P., however, the difficulty foreigners often encounter doing business in Japan has proved to be a great business opportunity instead. That’s because, unlike most other Indian companies doing business here, I.A.P. — whose board comprises three Japanese members and four Indians — specializes in servicing Japanese corporations and their overseas operations, said Vikram Kant Upadhyay, who co-founded I.A.P. in 2001. Then in his mid-20s, he had studied computer science at the University of Tokyo under Professor Ken Sakamura, Japan’s leading computer scientist and the developer of the TRON operating software. 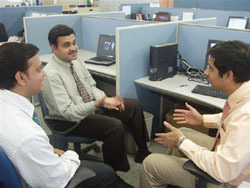 At I.A.P., Upadhyay explained, all employees are taught to address Japanese clients with the honorific “san,” and even before they get here they undergo between three and 12 months of training in India, covering the Japanese language, business manners (including how to correctly give and receive business cards and how to hold chopsticks) and Japanese-style project execution — which, he said, typically involves frequent requests for changes in specifications and oral, not written, agreements. But for the distance between Japan and India to narrow even further, people and cultures must mix at a deeper level, said Vibhav Kant Upadhyay, an elder brother of Vikram who also studied under Sakamura and is now chairman of India Center. 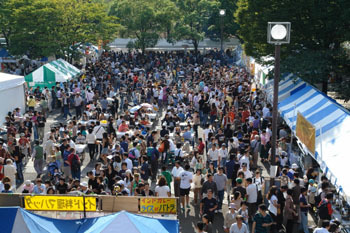 The center, which Vibhav established in 1996, has helped break down cultural and social barriers between the two countries by sponsoring cultural events and providing Japanese people with news from India. Strangely enough, it’s rarely political leaders who enable people from different cultures to understand each other and become friendly. In the case of South Korea-Japan relations, it has been Korean movie stars who have surmounted historical animosities to melt the hearts of Japanese both young and old and sent them flocking to Seoul. There may not be Indian pop stars waiting in the wings in a similar way, but as this Timeout feature makes clear — by examining the thriving Indian community here, how Indian children are studying alongside Japanese pupils and, of course, by tracing how Indian cuisine is going from strength to strength — gaps between India and Japan certainly appear to be rapidly and harmoniously closing.